2018 UPDATE: We had a wonderful 55th Class reunion on Friday, September 1, 2017 at Crowne Plaza located at 164 Ft. Couch Rd. Pittsburgh, PA 15241, and attended the annual CHS Reunion Picnic on Saturday, September 2, 2017 at Clairton Park. It was wonderful connecting with our Classmates, everyone enjoyed the evening. Not sure what our Committee will plan for the next five years, but an announcement will be posted here and on our Facebook page. Hope to see more of you in five years!! Stay Healthy and Safe Fellow Classmates. 2017 UPDATE: OUR 55th CLASS REUNION IS NOW IN THE PLANNING STAGE. OUR COMMITTEE HAS MET SEVERAL TIMES IN THE PAST YEAR. THE LAST MEETING WAS ON APRIL 25, 2017 AND WE ASSEMBLED THE REUNION LETTER WHICH WAS SENT TO ALL CLASSMATES ADDRESSES THAT WE HAD ON FILE. IF YOU HAVE NOT RECEIVED YOUR REUNION LETTER BY NOW, PLEASE CONTACT ME AT Balcorn1315@comcast.net WITH YOUR NEW ADDRESS AND A NEW LETTER WILL BE SENT TO YOU. THE REUNION PLANS FOR THE 55TH CLASS REUNION WILL BE ON FRIDAY, SEPTEMBER 1, 2017 AT CROWNE PLAZA, LOCATED AT 164 FORT COUCH RD, PITTSBURGH, PA 15241 AND JOINING THE ANNUAL CHS REUNION PICNIC ON SATURDAY, SEPTEMBER 2, 2017 AT CLAIRTON PARK LODGE. 2012 UPDATE: OUR 50TH CLASS REUNION WILL BE HELD FRIDAY, AUGUST 31, 2012 FROM 6PM TO 11PM AT THE CROWNE PLAZA, LOCATED AT 164 FORT COUCH RD, PITTSBURGH,PA 15241. WE ARE EXTENDING OUR REUNION CELEBRATION OVER THE DAY DAY ON SEPTEMBER 1, 2012 TO THE ANNUAL CHS REUNION PICNIC FROM 11AM TO 6PM. OUR NEXT MEETING IS PLANNED FOR SOMETIME AFTER AUGUST 1, 2012. IF YOU HAVE NOT RECEIVED YOUR REUNION LETTER,PLEASE NOTIFY ME AT BALCORN1315@COMCAST.NET. UPDATE: We are still looking for lost classmates, if you have not contacted us for many years and we do not have your updated address, please contact me by my email at Balcorn1315@comcast.net, I will be happy to add your info to our mailing list for the Big "50" class reunion on August 31, 2012! 2010 UPDATE: The Annual CHS picnic was held on September 4, 2010, about 800 classmates attended. This year nine 1962 CHS Classmates have registered so far. Hope to see more of our classmates there this year. UPDATE: The CHS annual picnic will be held on September 4, 2010, Labor Day weekend. The picnic is for all CHS class members from 1934 through 1970 now. The fee is $10.00 per person. Go to www.chsreunionpicnic.com to download the registration form to attend. Stop back here again for new news!!! August 2007Update: Our 45th Class Reunion was celebrated with a mixer on Friday night, August 24, 2007 at the American Legion in Clairton. Our formal reunion was held on Saturday night, August 25, 2007 at the Best Western Parkway Center Inn in Greentree, PA. Both events were a hugh success and all classmates that attended had a wonderful time. We had a special guest speaker, Mr. Donald Taylor who did a fantastic job renewing our high school memories. Also, we had Rev. Abraham Allende say the dinner prayer, closing prayer and comments. Thank you to both Mr. Taylor & Rev. Allende for offering their services. We are planning something very special for our 50th class reunion which will be held in 2012. Hope to see you all there! Don't forget to check out the pictures from our 45th class reunion, coming soon on this website!. Update:Clairton High School is planning a 100th Anniversary Reunion scheduled for the class year between 2006 and 2007. Each month there will be a special celebration for each year. The first graduating class was in 1907. Therefore,all CHS members from 1907 to 2007 are invited to attend the Anniversary celebrations. You can check the CHS website for more info. Update: We have made plans for our 45th Year Class Reunion. It will be held at the Best Western Parkway Center Inn in Greentree, PA on Saturday, August 25, 2007. We have also planned a mixer for Friday, August 24, 2007 at the VFW in Wilson PA. You will be receiving a letter with all the details in January 2007. Update 11/19/2007: The Reunion Committee for the 45th Class Reunion is Jack Miller, Frances Brenner Scruggs, Jackie Pavlack Buchina, Beverly Bailey Alcorn, Gerald Petrisin, and Charlotte LoPresti Peterson. 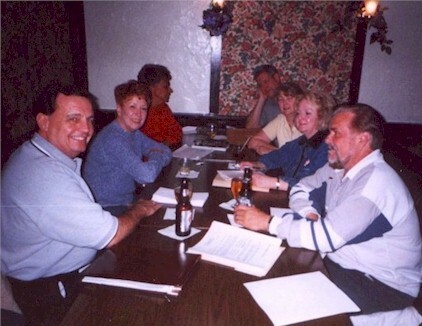 We took this picture of the Reunion Committee at our meeting (4-23-02), You can see how hard we've been working on planning the 40th Class Reunion. The Reunion Committee members want to thank all of our classmates who attended our 40th Year Class Reunion on August 23 & 24, 2002. We hope all of you enjoyed both the mixer & the reunion dinner & dancing, and were able to renew some lost friendships. Hope to see all of you at the next reunion in 4 or 5 years. Stay healthy and don't forget, if you move, contact us with your new address and don't forget, keep in touch.